The industry had an adversegrowth of 14% for the ninemonths over last year while V.S.T. is (-9%). The factors that impacted the adverse growth are adrought in Karnataka, Tamil Nadu and Kerala, delay ofthe launch of subsidy schemes and award of grants in some states like Andhra Pradesh, Orissa, Karnataka and Northeast, delay in roll out of DBT schemes, code of conducts due to elections in few states and demonetization. The company achieved 13.93% EBIDTA in first nine months compared to 17.77% last year due to adverse effects of anincrease in employee cost by 2% and overheads by 2.3%. During the nine months, the contribution to V.S.T. revenue from tractors has increased to 43% from 34% last year. Tiller contribution reduced to 54% which was 62% last year. Had 2,000 retail sales compared to about 1,200 in the same period last year.The shortfall of 9% compared to last year in subsidy sales. Revenue break-up for the quarter is Rs.54 crores from tillers, Rs.70 crores from tractors and spare parts areabout Rs.11 crores. In case of Tillers volumes are down by minus 9% compared to last year and by the end of this year would be adverse by 5% to 9%. The company expects to improve on the current adverse growth of 9% for tillers. 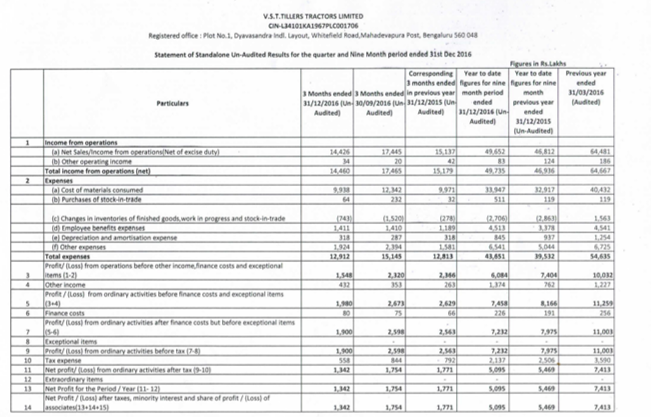 Higher revenue portion in tillers over the next two, three years and competition from Kirloskar especially in tillersbut market share has not been adversely impacted. In the Q3FY17 price of power, tillers increased toRs.1.5 lakh per unit from Rs.1.3 lakhs sequentiallyin some states. In case of power tillers, Karnataka Government finalizedthe rates. In Andhra and Orissa, the rateswere revised. In Tractors, the growth has been 20% and expected to be retained. In the less than 30 HP in Q3FY17 V.S.T. registered a growth of 30% and increase in market share from 12% to 16% over the same period of last year.While the overall industry registered an adverse growth of 3%. In the overall tractor segment, it grew to 1.3% from 1.2%. In the nine months’ period, V.S.T. registered 20% growth in volumes and gained 2% market share over last year in the less than 30HP segment whereas the industry recorded 4% growth. The overall industry growth in nine months’ period for tractors was 17% whereas V.S.T. reached 20%. Their overall market share in the industry in nine months is 1.4%. In 21 HP to 30 HP segment market share was zero last year compared to 5.6% market share nowand below 21 market share has come down from 29.9% to 27.5%. Sold 3,385 tractors in Maharashtra, 1,208 tractors in Gujrat, 744 tractors in Karnataka and 788 tractors in Andhra Pradesh. By2021 product mix will also be changed. Sold 150 number of 135 DI and 732 number of 27-HP tractors in Q3FY17. In the last nine months’company has invested something like 250 basis points in other expenses and another 200 basis points on theemployee side. To meet the network target of 350 dealers by 2020 and new product launches, there has been an Increase in someemployees in sales, marketing, and engineering. Increase in sales promotion from Rs.2.7 crores to Rs.5.2 crores and from Rs.14 crores to Rs.20 crores on commissions and discounts compared to last year for the same period. The outstanding subsidy receivable from various state and central governments today is about Rs.14 crores which are the subsidy overdue of last year. Have 70 custom hiring centers which are operational in Karnataka, but centers are not operating at their full efficiency due to draught this year, but next year it is expected to be profitable. The company has sales counter in the State of Madhya Pradesh, Punjab, Haryana, and UP. CAPEX plan for this year is about Rs.69 crores. Out of that Rs.40 crores are already spent mostly on buying a new property in Malur. Whitefield facility is very old, and the machineryis also old for this reasons company intend to shift. Plan to shift the existing tiller plant to that Malur facility and build up a state of the art facility. The corporate office will remainon Whitefield road. CAPEX in FY18 will be around approximately around Rs.100 crores whichwill be funded from internal accruals. Planned to come out with at least two product launchesthis year and by 2021 planning to move to higher HP tractors. Expecting some exports also to happen and that can result in better Y-O-Y basis drop than minus 9%. Expected to double its revenue by march 2021. Going to finalize distributor agreement with anAmericancompany and become authorized distributors of power waders. By March 2017 company will have about 220 dealers for tractors which was about 200 in 2015 and tillers will have the same number of 222. The spike in cotton prices will benefit the company because farmers will have some disposable income and they will invest more of mechanization. The company have so far sold about 76 power weeder and by the end of the year will sell 100 more and being a premium product it expects to sell about 500 in next year. Market size being around 20,000 or 25,000 and being a premium product with a price difference of aboutRs.15000 compared to Indian manufacturers it expects to sell about 500 in next year. Full-fledged DBT means the farmer pays the entire money to company upfront and then he waits for to receive the payment from the government. These actual allocation spending has increased to double to Rs.350 crores from Rs.165 crores, and in the next year, the government allocation is Rs.525 crores. There is no clarity as such when the government would release, but companyhas totie up with few banks and NBFCs to support the farmers. Company Incurred 1.5% of sales as a dealer incentive with regards to DBT. DBT scheme or the subsidy scheme is going to continue. 90% to 95% of the sales will happen either through subsidy or direct benefit transfers. Earlier company had to wait to get the subsidy payment;now dealers are responsible for collecting the subsidy. If dealers make acash payment and they will get 1.5% discount and also if they make the payments within 45 days, they get an additional Rs. 4,500 per unit as adiscount. The Central government has suggested that every state should go for DBT scheme. In the long run, if full-fledged DBT is implemented and the government can pay back the subsidy amount in less than a week the farmers will be benefitted. The central government will allocate to certain states. The states also have their budget and release the subsidy amount. Grants are planned from the centeror the state it is not very clearly spelled of whether it is for power tillers or whether it is for the attachments or whether it issomething else. This year in Karnataka the allocation has been lower than last year. In Orissa, the plan was higher than last year,but the allocationshave still not happened because of the code of conduct. In Andhra, the allocations are almost same as last year. In Tamil Nadu, it is status quo. Once the DBT is introduced, then we will know its pros and cons.It can impact. For a short while because the farmers are used to getting the subsidy by paying only the margin money.